The 11th National Congress of the Ho Chi Minh Communist Youth (HCYU) opened in Hanoi yesterday, drawing 999 delegates representing millions of the union’s members nationwide. 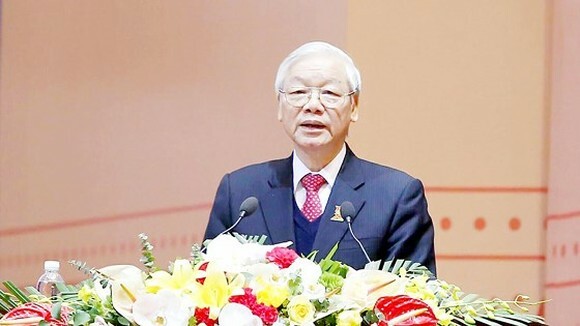 Addressing the opening session of the congress, Communist Party of Vietnam General Secretary Nguyen Phu Trong lauded the accomplishments of youth and children’s movements as well as the HCYU operations at all levels. The Party chief suggested that in the coming time, the union should pay greater attention to educating the youth on revolutionary ideals, political firmness, morality and lifestyle. The union should encourage and promote patriotism, revolutionary ideals and trust in the political regime among youngsters, he said. At the same time, he also asked the union to improve youngsters’ awareness about shamming information and the spurious, specious arguments of hostile forces, especially those arguments disseminated insidiously via social networks. The HCYU should uphold its central role in youth organisations of the country, while guiding the Ho Chi Minh Vanguard Children’s Union and working hard to protect and educate children, he said. The Party leader also asked the union to build mechanisms, policies and activities to foster the development of young people in all fields. Nguyen Phi Long, Secretary of the HCYU’s 10th Central Committee and President of the Vietnam Youth Federation, said that the congress will review and draw from the work of the past five years and set targets for the 2017-2022 period. The Congress will also make adjustments to the union’s Charter. He reported that youth and children’s movements in the past five years were successful, with 455,000 buildings, including houses and schools, constructed and over 2,200 projects launched in various fields. The voluntary and charity activities of the union drew 16 million participants nationwide, he added. During the last five years, more than eight million youth received career advice, 420,000 received vocational training and another two million were introduced to proper jobs. Up to 14,000 youth economic models and 356 youth cooperatives were also developed during the period, Long said. He said that in the 2017-2022 period the union will focus on fostering young generations with revolutionary ideals, strong political will and patriotism, as well as good health, critical thinking skills and aspirations for a better life and better world. He drafted 11 major targets of the union in the next five years, including proposing 5 million innovation initiatives for different sectors, planting 30 million trees, supporting 1,000 startup projects and providing VND10 trillion (US$444.4 million) in business loans to young people to boost agricultural production and contribute to the country’s economic development. The union also plans to give career consultations to 10 million young people, introduce jobs to 1.5 million others, and admit 5 million more members.